Our Estonian National Member Orgaisation (NMO) recently translated two series of IPOPI’s patient information leaflets from English to Estonian! The leaflets Treatments for primary immunodeficiencies, Stay healthy! A guide for patients and their families and A guide for Schools are now available in an additional language and can be downloaded here. 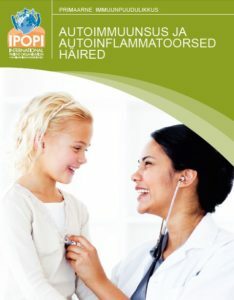 The leaflets Vaccines and primary Immunodeficiencies, Autoimmunity and autoinflammation and Plasma-derived therapies have also been translated and have now been uploaded to IPOPI’s website. IPOPI is always happy to collaborate with its NMOs to ensure that IPOPI patient information leaflets can be available to as many patients and stakeholders as possible. If your NMO is interested in translating IPOPI leaflets into your language please do let us know at info@ipopi.org !